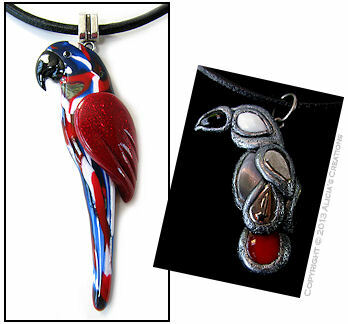 Enter to win the red Faux Ceramic bird necklace shown below! The contest runs through July 13th and is open to my newsletter members in the USA & Canada - good luck! A month or two ago, I looked at a book about polymer clay mosaics, and was instantly in love. I knew I had to try making some of my own, so I pulled out my clay, and got on quite a roll! I ended up spending days and days making hundreds of unique little tiles. I found it to be a wonderful way to mix and match a wide variety of techniques, and had so much fun! Needless to say - I'm utterly hooked!! I've already made several pieces as gifts, and am excited to be offering this Female Eclectus as the first mosaic for sale on eBay. I am hoping to be ready to return to accepting custom orders again in another month or two, and when I do, I may take requests for custom mosaics at that time! Let me know if you would be interested in one!